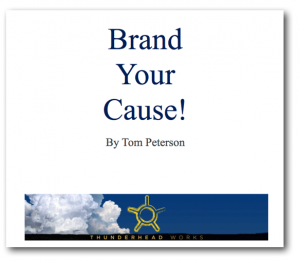 Click HERE or on the image for a free pdf E-Chapter, Brand Your Cause. Each year thousands, if not millions, will come into contact with your group. They may catch 60 seconds on the local news, see a magazine article or a friend’s Face- book like. They may glimpse it on a brochure or t-shirt. The cumulative effect of these touches forms the experience that person has of your organization. Whether they sought you out or stumbled upon you, they’ll judge you. If the experience is bad or mediocre, an opportunity is lost.